For this ten day Komodo National Park adventure Komodo Dancer was pleased to welcome onboard an all American team brought together by Jeff Jones from Weaver’s, Colorado. For the first day we left Labuan Bajo harbor for Sebayor Kecil for our first dive. With fabulous conditions we enjoyed the 2 1⁄2 hour cruise and looked forward to the critters that were waiting for us underwater. Scorpion leaf fish were seen lying in ambush on table corals while cuttlefish blended into the reef slope. On the sand rays swam by includ- ing a juvenile eagle ray and mantis shrimp went about their business and one was particularly brazen by walking around in the open overturning rocks and punching our pointers. Seen: Scorpion leaf fish, cuttlefish, peacock and banded mantis shrimps, eagle ray, blue spotted and ribbon tailed ray. Macro diving was the order of the day starting with Fuzzy Bottom in the north east of Sumbawa. 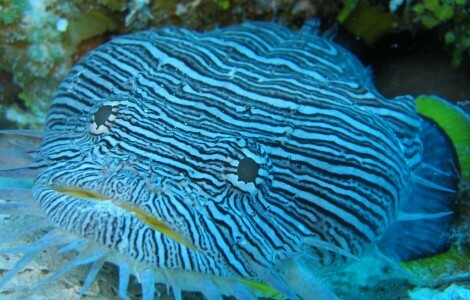 The visibility was down due to the recent strong currents as a result of the full moon but critters such as thorny seahorses, Pegasus seamoths and blue-winged lionfish were still spotted. On Rocky Bottom for the second dive our guests experienced “nudibranch heaven” with many people seeing new varieties for their first time with a particular highlight being pairs of chromodoris bollocki. As viz was reduced in the bay we opted for a dive at Tanjung Sai with silt bottom and bright corals. Here stick shrimp and black phase frogfish were found hiding in the black coral bushes along with lots of nudi- branchs, scorpion and crocodile fish. Even with currents still pushing in the Bima bay we did a repeat dive on Fuzzy Bottom for the night/drift/muck dive. Conditions had actually calmed down so we managed to pick out clown frogfish, long-armed starry octopus, moray and snake eels and tons of different crustaceans. Seen: Blue-winged lionfish, clown frogfish, black phase frogfish, thorny sea- horse, Pegasus seamoth, gilded and banded pipefish, long-armed starry octo- pus, ribbon eel, crocodile fish, raggy scorpion fish, nudibranchs (chromodoris, nembrotha, thuridilla, flatworms), juvenile barramundi, juvenile pinnate spade- fish. During the night captain Bapak Kasim moved the boat over to Gili Banta, north west of Komodo Island. Here we enjoyed a pleasant day of diving with good visibility, 28C water and sun all day long. We calmly cruised around the soft coral reef of K2 in the morning with people coming back with stories of the amazing amount of different clownfish and anemones that can be seen in this area. On the West Corner dive site we swam to the point of the current with some guests getting lucky with a manta and others with large dogtooth tuna. Schools of surgeon fish were feeding in the planktonic upwellings and other species were spawning in the shallows. Then it was back into the bay for “flighing lessons” on Star Wars. Those that could maneuver in the current saw pygmy seahorses while other drifted by colonies of bright purple anthias. The night dive at Circus seemed to exceed our guest expectations spotting stargazers, snake eels free swimming along with juvenile morays, bobtail squid, all kinds of shellfish and flatheads. stargazers, snake eels, bobtail squid. During early morning Ombak Biru cruised over to Sangeang Island for the next day of adventure. The first two dives were on Deep Purple and Hot Rock providing awesome topography, an amazing array of corals and wonderful marine life. Schooling barracuda and snapper were seen on the deep sections of the first dive while in the sand and reef ribbons eels, nudi’s and scorpion fish were resting. On the second the groups meandered around coral bombies covered with all types of soft and hard coral. Hiding crabs, shrimp, nudibranchs and pygmy seahorses were found and in the blue surgeon fish and snapper were swirling about. 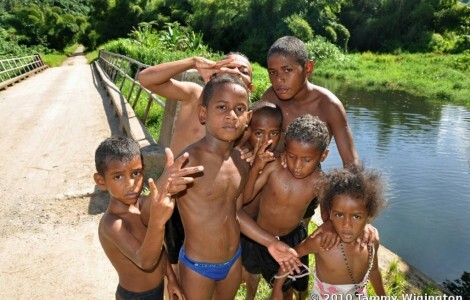 Then it was time for a stroll through the village of Bonto to see the simple life of 150 people. It was a humbling experience for our guests to see Indonesians living in such a differ- ent way than we are used to. Bonto reef at night was a blast with our groups slowly drifting over black sand and finishing on very busy coral pinnacles. Many different very pretty nudi- branchs were feeding on hydroids and pleurobranchs also made an appearance. Boxer crabs, Spanish dancers, red reef lobsters and a huge octopus were found on the reef section com- pleting a wonderful dive. Seen: Ribbon eels (juvenile & male and female adults), pygmy seahorses, school- ing fish (barracuda, twinspot and blue-lined snapper), nudibranchs (spanish dancer, chromodoris, nembrotha, thuridilla, tergipidoris, faceinidae, scyllaeidae, neon dragon), xeno crab, soft coral imitator crab, boxer crabs, pleurobranchs, reef octo- pus. Over night Bapak Kasim delivered the Komodo Dancer to the northern island of Komodo, Gililawa Laut, home to Castle and Crystal Rock. We jumped in on Castle first during some decent current which allowed us to watch shark, tuna and trevally action. For the second dive, on Crystal, the current was “less manic” so our groups were able to fin around all areas of the reef spotting an eagle ray, baby whitetips, frisky tuna and hunting goat fish, juvenile napoleons and emperor snapper. Then it was off to Gililawa Darat for the third dive through The Passage, a panoramic walk and a night dive on the Spanish Step. Guests came out from the Passage dive a little shell- shocked due to the medium current pushing through the channel. Whitetips were spotted sleeping along with GTs and schooling sweetlips and spadefish. For those with enough energy we walked up to a view point on Darat and walked along the ridge. This gave us a tremen- dous view of the bay and the water pouring through the channel we had just dived. On Spanish Step for the night dive divers saw the mandatory largest nudibranchs in the world along with their emperor shrimps and on this night they also has cuttlefish keeping them com- pany. Seen: Whitetip and grey reef sharks, GTs, blue-fin trevally, dogtooth tuna, schooling fish (horse-eye jacks, black, blue-lined and twinspot snapper, banners), crocodile fish, nudibranchs, golden-claw swimming crab, sea krait, Spanish dancers, em- peror shrimp. We powered down the Linta Strait in record time due to a strong lowering tide and woke up in Langkoi Bay in the morning. We then proceeded to dive twice on Manta Alley exploring the site completely by drifting from west to east on one occasion and even swimming a figure of eight around the outside pinnacles, which is hardly ever done. Waters were warm and blue so the manta count was a bit low but most managed to bump into a few of them. However the site was covered in billions of orange and purple anthias with bumphead parrotfish feeding in the shallows and napoleon wrasse cruising around the channels. The next dive was Cannibal Rock in Horseshoe Bay on the south of Rinca Island and proved to be of great entertainment for our divers. The current was low so allowed us to corkscrew around the seamount spotting nurse and whitetip sharks, schooling blue-lined snappers and loads of macro fauna. On the fire urchins zebra crabs and commensal shrimp pairs were resting, black and grey giant frogfish were hiding on the reef and sea apples were feeding. For the night dive we jumped in on a windy Torpedo Alley and were surprised with the contrast of surface to underwater conditions. The dive was so tranquil with the group investigating the giant sea pens for shrimp and squat lobsters. A baby tiger mantis was found peering out from the dark sand bottom and a dragon shrimp was seen clutching onto a green wire coral. Seen: Mantas, hawksbill turtles, dogtooth tuna, GTs, blue-fin trevally, nudi- branchs, napoleon wrasse, bumphead parrotfish, giant frogfish, fire urchins, colman shrimp, zebra crabs, sea pens, dragon shrimp, tiger mantis. First thing in the morning we jumped on the tenders and headed out to see the Komodo Dragons on the beach. This proved to be good timing as the males were attempting to mate with one of the females. Eagles were flying high as it was blowing about 20 knots so we headed north for calmer conditions. Our first stop was Secret Garden at Padar for a coral garden and wall dive spotting mantas, a whitetip and a performing black giant frogfish. We then headed into Current City for the rising tide on Makasar Reef. 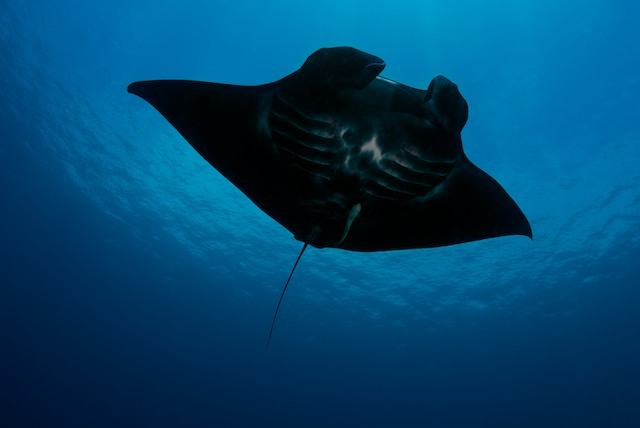 Even though the drift was pleasant there were not many mantas about but a few were spotted. To seek shelter for the night from the strong south-easterly winds we anchored at Wainilu in north Rinca and went for a night dive in search of critters. A huge tiger mantis was found along with fishing frog- fish, enemy ghost demon stingers and crustaceans galore. Seen: Manta rays, whitetip reef shark, feather-tail stingray, giant frogfish, school- ing fish (red triggers, blue surgeons, emperor snapper) spadefish, mantis shrimp, flatworms and nudibranchs, blacktip reef shark, bamboo shark, common stingray, warty frogfish, reef squid, demon stingers, tiger mantis. A full drift dive on Shotgun was the order of the morning during a slow falling tide. Schooling black and twinspot snapper swirled on the shallow reef while a manta and two mobu- las were waiting for us in the current. To finish the soft coral garden was bathing in the morning sun to highlight yellow trumpet fish, schooling goatfish and turtles having a bit of breakfast. For the second dive of the day Tatawa Besar provided a good drift over the beautiful soft coral garden and finished with the group watching large cuttlefish tend to their eggs in the hard coral. On the way south through the Linta Strait we dived at Honeymoon Rock again with schooling fish with mantis shrimp, nudibranchs, cowries and an eagle ray. One of the requests for the trip was to find mandarin and picturesque dragonets so we jumped in for a sunset dive at Wainilu to search for the little buggers. The highlight of the dive was undoubtedly the frogfish and not the mandarin fish! Seen: Manta ray, mobula manta rays, schooling fish (barracuda, black, twinspot and sweetlip snapper, spadefish), barramundi, GTs, hawksbill turtles, hawksbill and green turtles, nesting cuttlefish, eagle ray, mandarin fish, picturesque dragonets, warty frogfish, clown frogfish. The Linta Strait was very choppy in the morning due to strong winds so we dived in Gililawa Laut again, much to the pleasure of our guests. The first dive was timed for a changing current on Crystal Rock. This allowed some to fin out to the third pinnacle to watch fifty to sixty GTs hunting while on the other two pinnacles whitetips and grey reefs were seen cruising around. Sweetlip and humphead snap- per were schooling to the side of coral bombies and large napoleon wrasse came into investigate the divers. Shotgun was the choice for the second dive so once again we drifted through the channel and ended up on the soft coral garden. Most of the guests came out of this one absolutely amazed by the beauty of the dive. In the afternoon we jumped in on Castle Rock to be surrounded by schooling fish. Tons of fusiliers being hunted bounced from the reef to the blue, rainbow runners intercepted swarms of banner fish while most of the divers were followed by inquisitive batfish. This dive made us feel like we were accepted by the marine animals as we were completely engulfed by huge numbers of them, a truly memorable experience. For the night dive divers searched Komodo mini wall and found sleeping turtles, decora- tor crabs and juvenile sweetlip snapper. Seen: Grey and whitetip reef sharks, schooling fish (rainbow runners, sweetlip, black and twinspot snappers, banners, batfish, surgeons, horse- eye jacks, fusiliers) sweetlip snapper (ribbon, oriental, diagonal lined, gi- ant), GTs, dogtooth tuna, rays, sea krait, various groupers, hawksbill tur- tles, crustaceans, cuttlefish. For the final two dives of the trip we chose Lighthouse reef in Gililawa Laut and Makasar reef in current city. 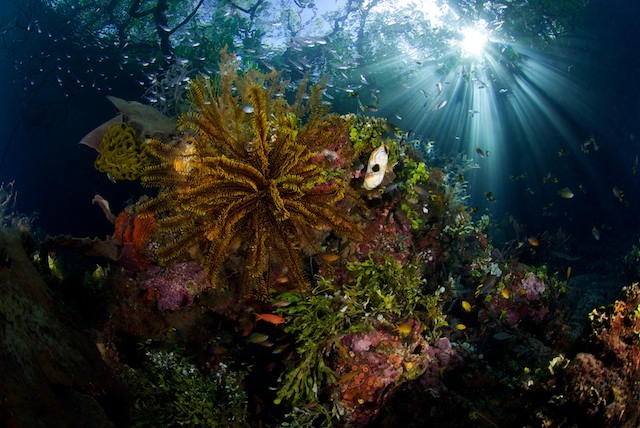 The first dive was bathing in the morning sun highlighting the wonderful mix of hard and soft corals. Various species of nudibranchs were found and whitetip reef shark juveniles were seen snoozing under the table corals. For the second and last dive in Komodo National Park we drifted on Makasar reef coming across a manta ray, large green turtles and whitetip sharks with mating scars. This dive once again finished on a glorious coral garden lit up by the sun where we said our goodbyes to the underwater world. Within a couple of hours we were once again loading ourselves back onto the tenders this time for the dragon walk on the north of Rinca Island. Five adult dragons were hanging around the ranger kitchen area and you could tell it was mating season because you could see couples lying on each other. From north Rinca we sailed through the sunset back to Labuan Bajo Flores for our final dinner together. A big thanks goes out to the Weaver’s crew for putting this trip together. It has been a pleasure to have you all on board and we hope to see you soon in the near future. Seen: Whitetip reef sharks, nudibranchs, a manta ray, green turtles, marbled ray, various groupers, square-spot anthias. Thanks to Mark and Frank for the photographs. nice article. It makes me really want to go to the island of Komodo and do the same thing. I never thought that in fact a lot of water activities that can be done while visiting exotic locations like the island of Komodo. Have you already tried the tourist accommodation in place? tell me about http://www.komodoresort.com/page.php?page=19 . It was great to meet up with other native life was bleak. Nice share. thanks.